Carl Lee Perkins was born near Tiptonville, Tennessee in 1932. At 7, he began playing a guitar that his father had made from a cigar box, broomstick and baling wire. He listened to country music, gospel, and blues, and began to write some of his own compositions. At age 13 he performed a song that he had written, Movie Magg, at a local talent show and won. He formed a group with Jay and Clayton called the Perkins Brothers which began to perform at a local honky tonk known as the El Rancho Club in 1947 and 1948. W. B. Holland joined the group as a drummer. They appeared on WDXT radio in his hometown of Jackson, Tennessee from 1950 to 1952. Meanwhile, Carl spent many years working during the day at Colonial Baking Company in Jackson Tennessee as a baker. Carl signed a recording contract with Flip Records, a subsidiary of Sun in Memphis, in 1954. His first release was Movie Magg the following year, and it was followed by other songs such as Gone, Gone, Gone, Let The Juke Box Keep On Playing, and Blue Suede Shoes. He wrote "Blue Suede Shoes" after hearing a boy telling his prom date not to step on his blue suede shoes. Perkins went back to his home in a housing project and wrote the song on a brown potato sack. He recorded the song at Sun in December, 1955, was released on the Sun label and took off nationally. It reached number two on the pop and country charts in 1956. That song put 23-year old Carl Perkins in the national spotlight. Appearances were arranged on the Ed Sullivan and Perry Como TV shows, but while traveling to New York for those engagements he was involved in a terrible automobile accident that hospitalized him. Another up-and-coming Sun artist, Elvis Presley, covered Blue Suede Shoes, which became Elvis' third top forty hit. These events served to steal some of the thunder from Carl Perkins' rise, and Carl never quite recovered his momentum in the world of pop, although his place in music history was assured. An excellent guitar player, he continued doing music in his own style, which was pure rockabilly. The flip side of Blue Suede Shoes was Honey Don't, which had originally been intended as the A-side. Honey Don't was discovered by the Beatles who covered it along with two more of Carl's songs, Everybody's Trying To Be My Baby and Matchbox. Latter day pop artists who would acknowledge the influence of Carl Perkins include Rick Nelson, John Fogerty, Bob Dylan, Eric Clapton, and Paul McCartney, who said "If there were no Carl Perkins, there would be no Beatles." Following the death of his brother Jay in 1958, Carl signed a deal with Columbia. Songs by country influenced singers such as Buddy Knox and the Everly Brothers were crossing over to the pop charts. Carl had some more minor pop hits with records such as Pink Pedal Pushers and Pointed Toe Shoes, but he eventually went back to country music. He signed with the Dollie label in 1963 and joined his friend Johnny Cash's road show in 1965. He stayed with Cash for ten years, performing solo at times, and occasionally writing songs. Carl continued recording country songs into the 70's. His brother Clayton passed away in 1974. In the mid-70's he appeared at the Wembley Festival in England and advertised his new album, Old Blue Suede Shoes Is Back Again, on British television. He worked with a five-man band that included his sons Stan and Gregg. He also collaborated with other notable artists over the years, including his work on the album The Million Dollar Quartet with Cash, Presley, and Jerry Lee Lewis and on The Trio Plus with Lewis, Charley Pride, and The Judds and Billy Ray Cyrus. 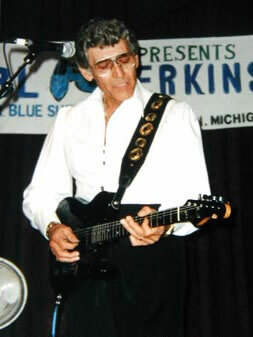 Carl Perkins appeared in the 1985 film Into The Night and won the Grammy Hall of Fame Award in 1986 for Blue Suede Shoes. He took his place in the Rock and Roll Hall of Fame in 1987. Carl Perkins was not only an international legend and entertainer, but locally he was a civic minded patron and founder of the Exchange Club - Carl Perkins Center for the Prevention of Child Abuse. In 1979, the news media in Jackson carried a local story about a child who died as a result of child abuse. Carl, a resident of Jackson, saw the child's picture and thought the child resembled one of his own children. He was so moved by the tragic story, he helped to organize a successful concert and the proceeds generated were combined with funds received through a National Exchange Club Grant. This allowed the center to open its doors in October 1981. This was the first Exchange Club Center in Tennessee and the fourth nationwide. In later years, Carl suffered a series of strokes. 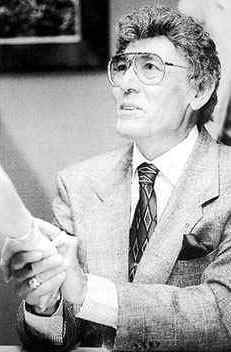 Though he had been ill, the news still stunned us all on January 19, 1998 when it was announced that Carl Perkins had died in Jackson. Carl had battled serious illness before. He was such a gentle soul. It just seemed he had always been and would continue to be the quiet king of rockabilly music.